Mont Saint-Michel is one of those bucket list destinations. 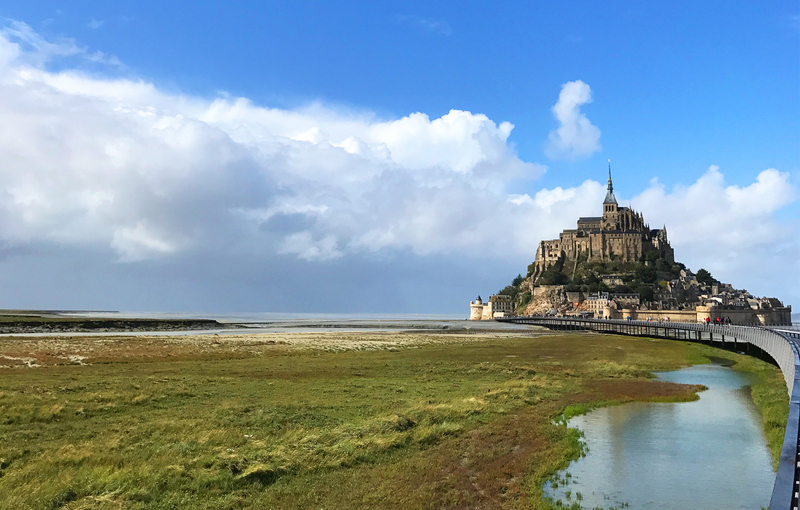 Located 250 miles west of Paris in Normandy, this floating island crowned by an abbey dedicated to St. Michael has attracted faithful pilgrims and modern-day travelers alike for more than a thousand years. It’s a striking enigma where the elements of storm and sea are constantly at play. At low tide Mont Saint-Michel appears to be a mirage in the middle of the barren mudflats, and at high tide a dream-like castle surrounded by water as the phenomenon of the tides work their magic each day. I’d been wanting to visit this wondrous place for years and finally got serious about it. 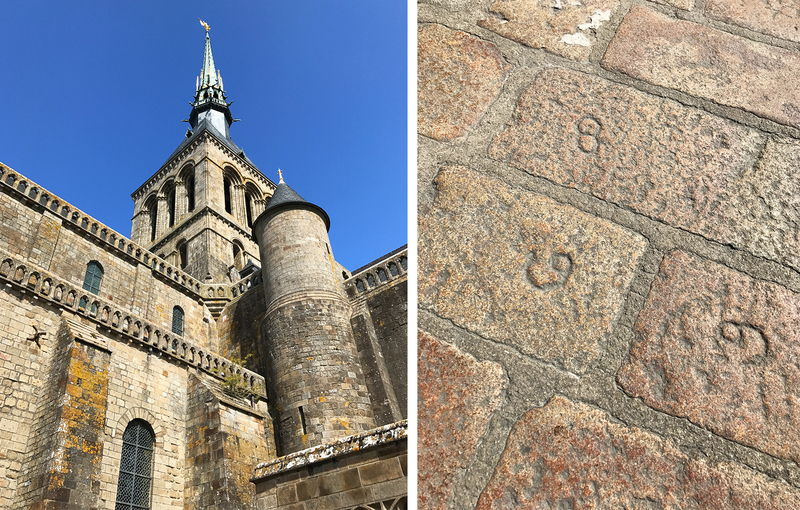 When I started looking into how to visit Mont Saint-Michel from Paris, I learned that it’s a long and logistically challenging daytrip to do on your own (especially if you want to witness the tides at their extremes). Because of that many people opt to stay overnight in Normandy or visit as part of an organized group tour. The latter option is a bit on the pricy side and makes for a long day, spanning about 14 hours from start to finish. 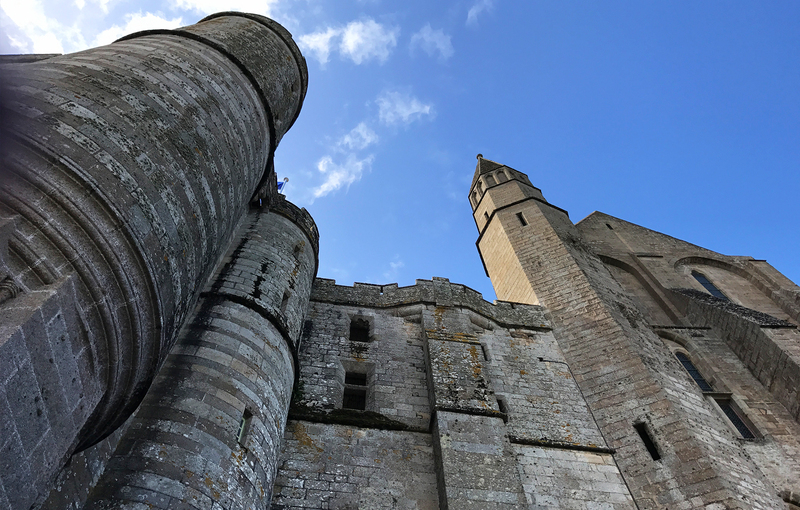 These factors had me going back and forth as to whether or not this was the right trip to visit Mont Saint-Michel but review after review reaffirmed that it’s definitely worth it. So with that, we booked a daytrip that included a guided tour and lunch through PARISCityVISION. Not only did it make for an easy and enjoyable experience, but we also gained a ton of knowledge and insight along the way. Mont Saint-Michel dates back to 708 AD when St. Michael the Archangel appeared to a local bishop in a dream (3 dreams actually), instructing him to build a church on the rocky island. The structure we see today was constructed between the 10th and 16th centuries, with defensive ramparts added in the 14th century to protect the abbey and village from English invasion during the Hundred Year’s War and the newly-invented cannon. Over the years it’s served various roles from Benedictine monastery and pilgrimage destination to a prison in the 18th century. Thereafter a campaign led by author Victor Hugo was launched to restore Mont Saint-Michel to its former glory. It was recognized as a UNESCO World Heritage Site in 1979 and today is home to the Order of the Fraternity of Jerusalem, with about 5 monks and 5 nuns currently living and worshiping in the abbey. 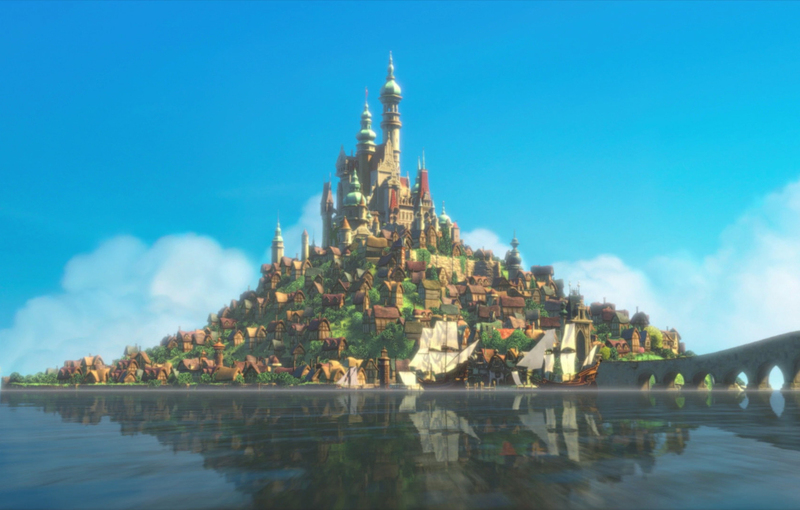 Mont Saint-Michel even served as the inspiration for the castle in the 2010 Disney movie Tangled. On the day of our tour we departed from PARISCityVISION’s office near the Tulleries around 7 a.m. We scouted out seats on the top level of the double-decker coach so we would have a good view of our surroundings as we left the urban streets of Paris for the rural countryside of Normandy. Our guide Natie was super sweet and informative, sharing interesting tidbits as we drove through the rolling green hills – like how cows (5 million) outnumber the people (3 million) living in Normandy, which is one of the reasons why the region is responsible for 80% of France’s butter production, not to mention cheese (Camembert being the most popular). The area is also home to tons of apples that are used to make cider and a special brandy called Calvados. 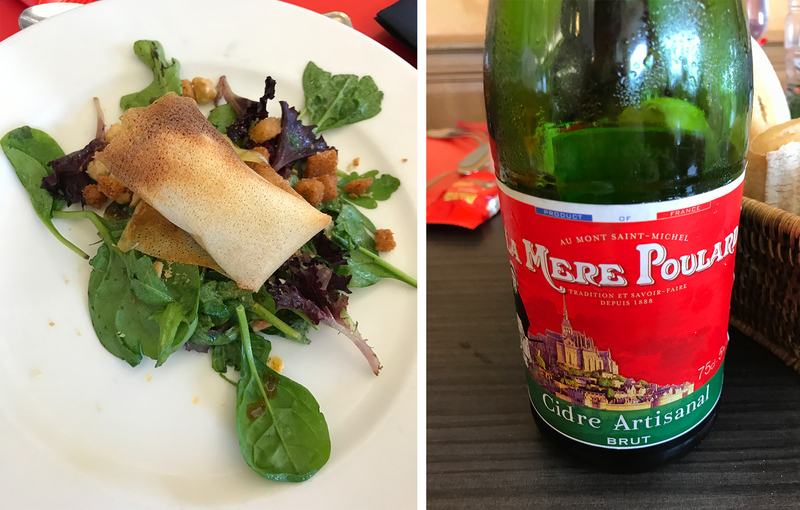 This was a great primer for our lunch at the Relais Saint-Michel restaurant, which include many of these local specialties like a warm Camembert-filled crêpe served over a salad, followed by salmon with rice and vegetables (and roasted chicken for me) and apple cake for dessert along with the famed apple cider to drink. 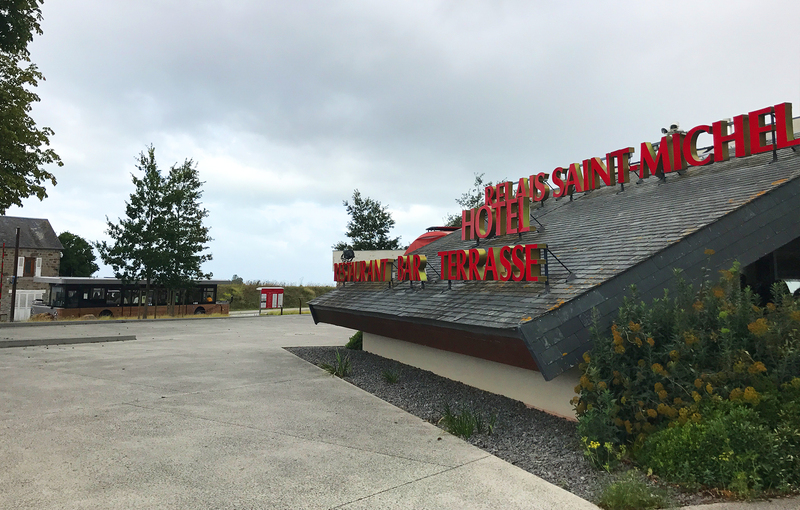 The restaurant is conveniently located across from the bus stop where a free shuttle takes visitors from the mainland across the bridge to Mont Saint-Michel. It was here that we got our first good glimpse of the abbey in the distance, which resembled a giant rock perched gently on the horizon. At this point the wind had really kicked up and it looked as if a terrible storm was blowing in, making our approach even more impressive. We exited the shuttle bus and Mont Saint-Michel towered over us. The experience can only be described as surreal, echoing the intensity that countless pilgrims must have felt upon reaching their final destination in centuries past. 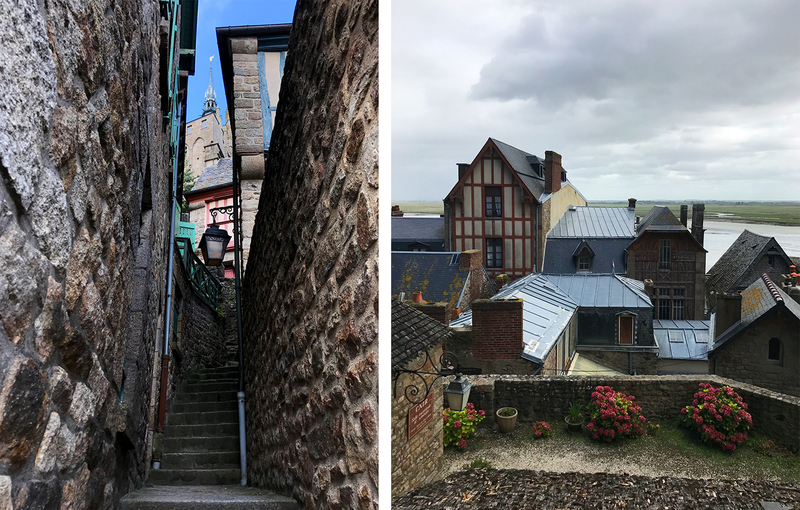 Led by Natie, our tour first began in the village that hugs the base of Mont Saint-Michel, spiraling upwards towards the abbey. The one piece of helpful advice she offered our group should anyone get lost was if we see stairs, take them (“always up” to reach the abbey). The village was ripe for wandering, filled with adorable little shops and cafes that primarily cater to tourists (as they always have) with seemingly steeper stairs and narrower passageways the closer we got to the top. The abbey itself is impressive to say the least, defined primarily by Gothic architecture infused with Romanesque and Norman elements, reflecting the advancement of building technology and tools over time. Once inside our first stop was to the west terrace with unobstructed views of the vast mudflats and surrounding coastline. We were literally “walking on the wages of workers” as the numbered stones below our feet corresponded with the individuals who made them, a simple way to add up how much each stonecutter should be paid. We continued inside the abbey church, a dull space that was once vibrant with paint and stained glass before being stripped of its color by the area’s harsh winds. A spire was added to the church in 1897, complete with a gold statue of the Archangel Michael facing southward to welcome pilgrims as they approached. When the statue was restored in 1987 a helicopter was required to remove and return it to its place atop the church. 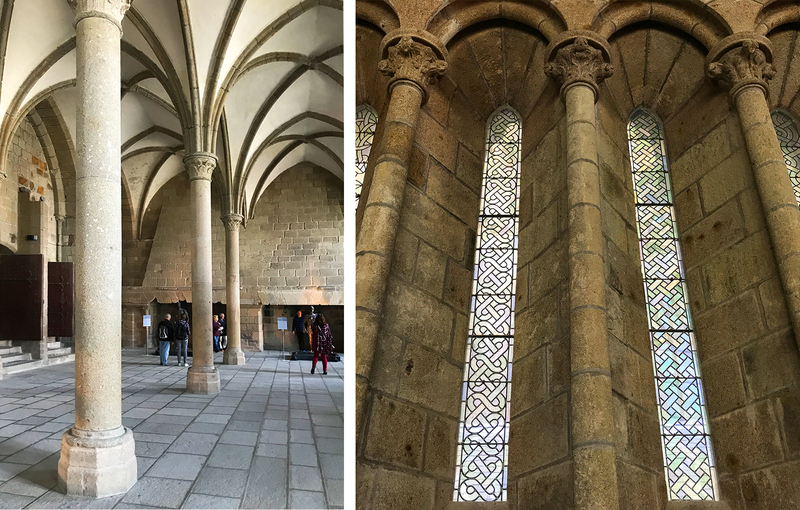 Our tour took us through other spaces including the cloisters, refectory, study rooms and various chapels and halls, learning about the use and construction of each room along the way. 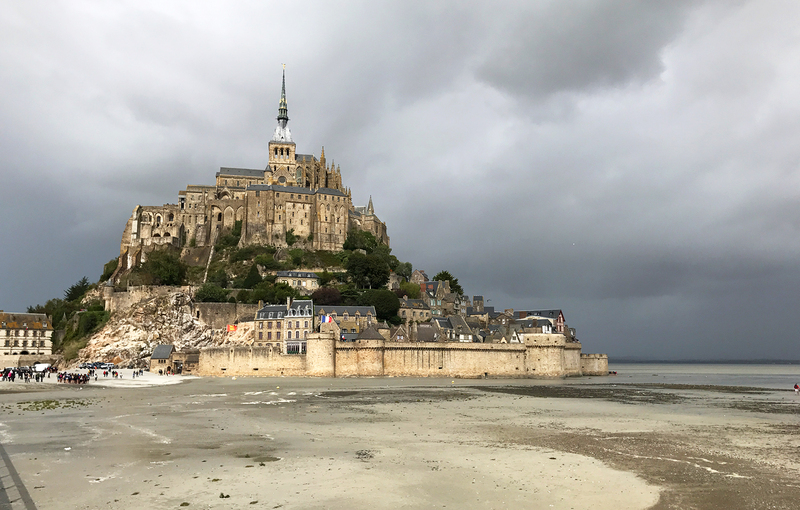 After the completion of our tour, we had a little less than an hour of free time to walk around the ramparts that overlooked the mudflats and wander back down through the village, dodging a few sudden downpours by popping in and out of gift shops. The storms just as suddenly seemed to subside so we decided to walk back to the mainland rather than wait in line for the shuttle bus, something I would highly recommend doing in either direction weather permitting. Thereafter we re-boarded our group’s coach to head back to Paris, arriving in the city a little after 9pm. 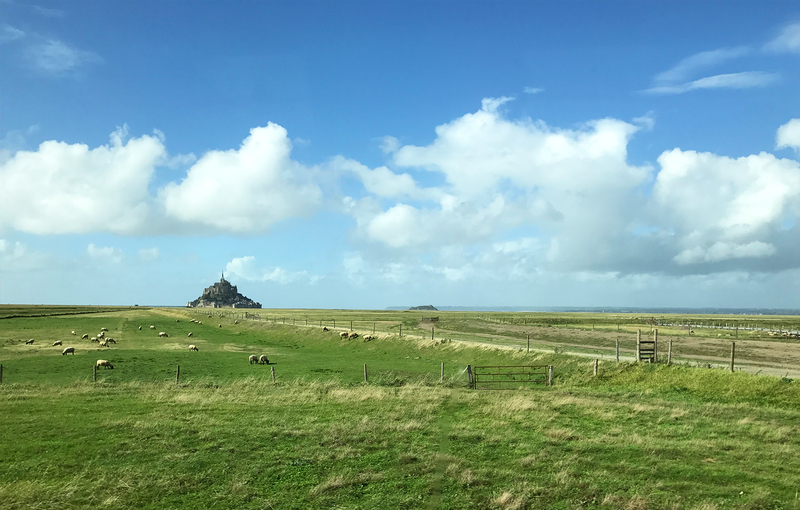 Our parting image of Mont Saint-Michel was that of the abbey in the distance as sheep with black noses and feet grazed peacefully in the meadows nearby (their extra salty meat is generally reserved to eat for special occasions, especially during Eastertime). You don’t have to be a pilgrim to enjoy Mont Saint-Michel as 3 million visitors just like us come to marvel at this destination each year. Thanks to our great guide this long daytrip was more than worthwhile and I definitely want to return again for a longer visit in the future. What to wear – The weather can change in an instant as we witnessed multiple times during our visit, from extreme wind and rain to clear blue sunny skies. Be prepared with several layers including a good jacket and shoes that you don’t mind getting wet. An umbrella may also be good to bring too. 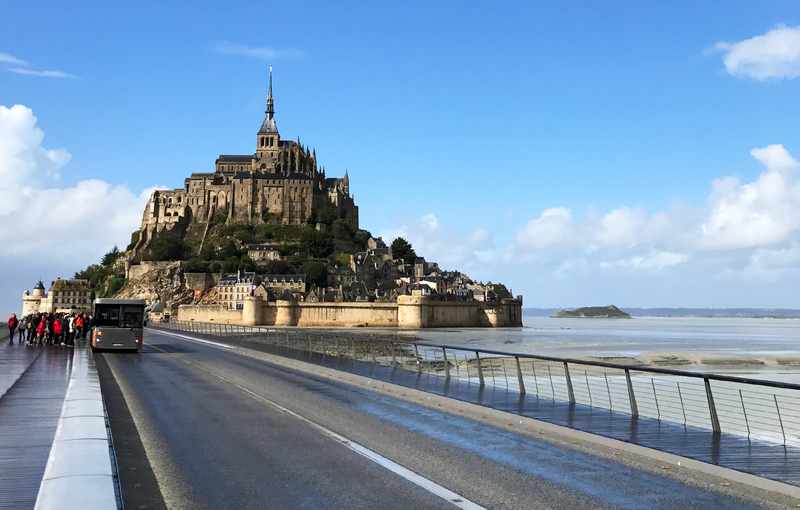 Getting across the bridge – You have a few options to get from the mainland to Mont Saint-Michel. A free shuttle bus makes stops at both the visitor parking lot and outside the Relais Saint-Michel restaurant where we ate lunch. Buses tend to fill up quickly but come about every 5 minutes. Weather permitting you can also walk across the bridge to the island, which takes about 30-45 minutes depending on your pace (and how often you stop to take photos). And if you’re feeling particularly fancy you can also take a horse-drawn carriage. Touring the mudflats – At low tide it’s possible to walk across the bay in the mudflats but only with a certified guide. Read more here or visit the tourist information office near the parking lot for more details. Entering the mudflats on your own without a guide can be extremely dangerous. Witnessing the tides – Seeing the tides roll in and out can be an unforgettable experience. 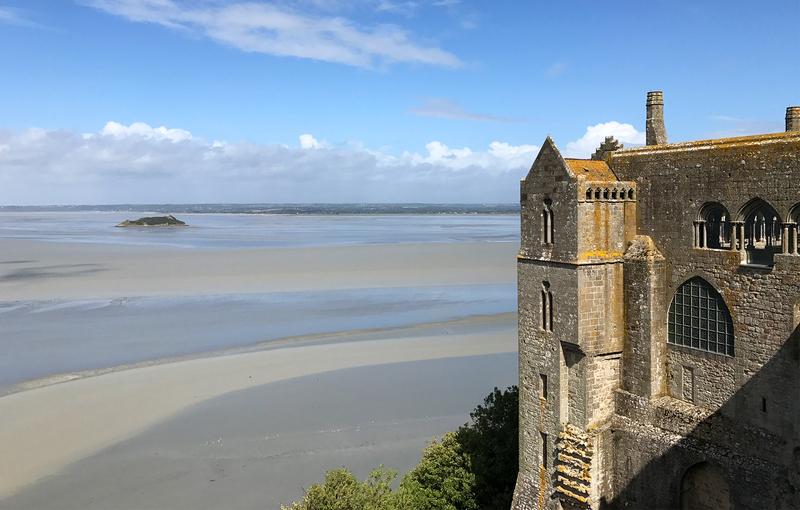 A timetable of high and low tides is posted at the base of Mont Saint-Michel as well as online here. The most recent “tide of the century” was on March 21, 2015 and measured more than 14 meters high, completely engulfing the island with water, which you can read more about here. Going to mass at the abbey – Mass is celebrated every day except for Mondays at the abbey church and is open to visitors. Times and details about attending a mass service can be found here. Eating near Mont Saint-Michel – You’ll find several restaurants on the mainland (primarily attached to hotels) and a handful of other places to eat in the village below Mont Saint-Michel offering specialties like seafood, crêpes and the region’s famed fluffy omelets. The restaurant La Mère Poulard near the main entrance of the village is named after Madame Poulard who is credited with creating this particular type of omelet for pilgrims in the late 1800s.